Monday October 1, the Travelers had two parts to our day. This church, Ikhanoda, like many churches in Tanzania, once ran primary and secondary schools. Over the years, the government "confiscated" them and began to run them, requiring that all children in primary school attend the public schools. Churches could still operate Kindergartens, so Ikhanoda church did, holding classes in their church building. The government decided the church did not meet the standards required, so now the church children must attend public Kindergarten until the church can get their space to meet the requirements ("roadblocks") and then hire a qualified teacher. 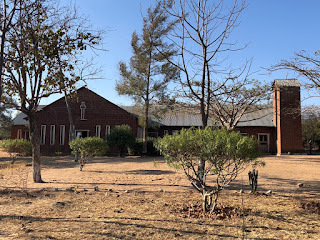 Well, Ikhanoda congregation is doing just that - reworking their old church building while, at the same time, working to complete the construction of their new sanctuary building, which began its construction in 1991! And why are the people so intent on having their own kindergarten? When we visited the public school Kindergarten class there were 120 (!!!) students in one room with a single teacher. After visiting all seven classrooms in the school (one per grade) we went back to the Ikhanoda church to view the old church, see the new building, and meet the leaders. After we all introduced ourselves, we prayed. The photo below happened just after the prayers. Our final experience at the Ikhanoda church was another surprising blessing (the whole morning was one surprising blessing after another) - we were treated to a home cooked meal! The food was delicious and the company so warm, welcoming and happy. We do not yet know, as I write this, how Mount Olive will be of help to these people - people so full of faith and hope - but we certainly intend to find out.